Sonny West and me during Elvis Week 2005. 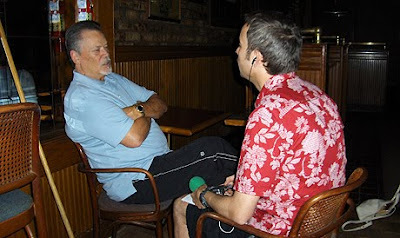 Writing about Sonny West's book Elvis: Still Taking Care Of Business made me think of the time when I met Sonny during Elvis Week 2005 in Memphis. Unfortunately, it was a bit of a disappointing experience. At the time I was working for the Swedish Radio (SR) so naturally I brought a tape recorder along should the opportunity arise to interview people from the Elvis world. I didn't have to wait long as Sonny West was working at the hotel where I was staying, with his show Moments with Elvis. One evening I gathered courage and approached him, asking if I it would be possible to do a short interview with him at his convenience. He gracefully told me that he had some time the next day, and told me when to meet. Naturally I was thrilled, here was an opportunity to get inside knowledge about the person I worshiped since I was ten years old! Elvis is more famous than ever, nearly 30 years after his death. What's your comment about the fame he has now? You are here in Memphis to talk about Elvis. What is the most important thing to tell people about him? You worked for him for many years? How was it? What was the best part? Was it difficult to come in close contact with him, to talk just the two of you? What's your biggest, single experience with Elvis? Your cousin Red West wrote songs to Elvis, did you? How did your life change after Elvis death? The next day I turned up at the time and place mentioned by Sonny West and was thrilled to find him there ready to answer my questions. We sat down opposite each other and I turned on the tape recorder and fired away. Unfortunately, after about five minutes his mobile phone rang. After the call, he apologetically told me that he had to go, but could we meet the same time tomorrow? Naturally I told him yes. I was a little bit disappointed, sure, but if I could ask him all my questions the day after, no harm done. Unfortunately it wasn't to be. You see, twenty four hours later, as I returned to the room where we met the day before, I spotted Sonny West next to a reporter armed with a video camera. Sonny looked at me like he didn't recognized me and told me that he had promised the TV guy to do an interview now. But if I turned up tomorrow, he could talk to me. I was confused, to say the least. Had he forgotten all about our appointment the day before and breaking off the interview after that telephone call? I decided to give him the benefit of the doubt and try once more the next day. But guess what? He wasn't there. This time around my confusion turned to disappointment. To this day I can't help but thinking about my abortive encounter with Sonny West when his name turns up. Maybe I'm being foolish, as he probably meets fans every day all the time and it's easy to forget a guy from Sweden wanting to ask some questions. But that day, as I stood alone waiting for Sonny West who didn't turn up, I didn't think he was taking very good care of business. PS: Sonny West did manage to answer my first question before the phone rang and he excused himself. He told me that he, five years after Elvis death, didn't think Elvis would continue to be as popular as he was then. But because new fans discover his music, he continues to be at least as famous now as then.